Transparency Market Research (TMR) has published a new report titled, “Adult Malignant Glioma Therapeutics Market - Global Industry Analysis, Size, Share, Growth, Trends, and Forecast, 2018–2026”. According to the report, the global adult malignant glioma therapeutics market was valued at US$ 1,349.6 Mn in 2017 and is projected to expand at a CAGR of 9.2% from 2018 to 2026. The global market is anticipated to witness steady growth owing to promising effective therapies in the pipeline for addressing the gaps in treatment. Development of a promising drug to treat malignant glioma has proved difficult to date, with a number of promising candidates failing to achieve the desired test results in the past few years. However, technological advancements in the diagnosis of gliomas and analysis of its progression through various imaging modalities has improved the survival rates, thereby giving an enhanced edge for rapid evaluation of efficacy of several pipeline drugs. North America and Europe are projected to dominate the global adult malignant glioma therapeutics market during the forecast period, primarily due to the significant reimbursement coverage. The market in Asia Pacific is expected to expand at a significant CAGR from 2018 to 2026. According to the World Health Organization, globally, an estimated 245,000 cases of brain and nervous system tumors are reported each year. Glioblastoma multiforme is the most common and the most lethal of these tumors. Gliomas are categorized under rare diseases; however, the incidence rate across the globe has witnessed steady rise in the last decade. Adoption of novel drug discovery technologies, such as high-throughput screening and TCGA, has reduced the overall drug discovery time and the cost of drug development. This is attributed to rise in the number of players participating in new product development and launches in various therapy areas, including glioma. These factors are likely to drive the global adult malignant glioma therapeutics market during the forecast period. In terms of type, the global adult malignant glioma therapeutics market has been classified into glioblastoma multiforme, anaplastic astrocytoma, anaplastic oligodendroglioma, anaplastic oligoastrocytoma, and others. The glioblastoma multiforme segment is projected to hold dominant share of the global market during the forecast period, owing to gradual rise in adoption of novel drug therapies, rapidly increasing patient population, surge in investment in research and development of targeted therapies to improve survival rates, and significant improvements in hospital infrastructure in high growth potential developing countries. In terms of therapy, the global adult malignant glioma therapeutics market has been divided into chemotherapy, targeted drug therapy, and radiation drug therapy. The chemotherapy segment has been classified into temozolomide, bevacizumab, carmustine, and others. The targeted drug therapy segment has been categorized into EGFR inhibitors, other monoclonal antibodies, and others. The targeted drug therapy segment dominated the global adult malignant glioma therapeutics market in 2017 owing to high cost of therapy and high patient preference. The segment is also likely to register above-average growth rate due to development of new combination therapies with novel technologies such as gene therapy, nucleic acid therapies, lytic viruses, stem cells, nanoparticles, and others, and rise in focus on reducing cost of care to address the demand for affordable care. North America and Europe held over 60% share of the global adult malignant glioma therapeutics market in 2017. This is attributed to higher cost of therapy than that in developing regions, high adoption rate of technologically-advanced products, greater reimbursement coverage that ensures return on investment for emerging market entrants, and provision of orphan drug designation that aids in the process of drug approval. Developing countries such as China and India are likely to offer significant opportunities during the forecast period owing to above average incidence rate of malignant gliomas, significant geriatric population, rise in awareness about early diagnosis and treatment compliance, and improving health care infrastructure. The market in these countries is highly price sensitive and regulated by a government cap on the prices of therapeutics. 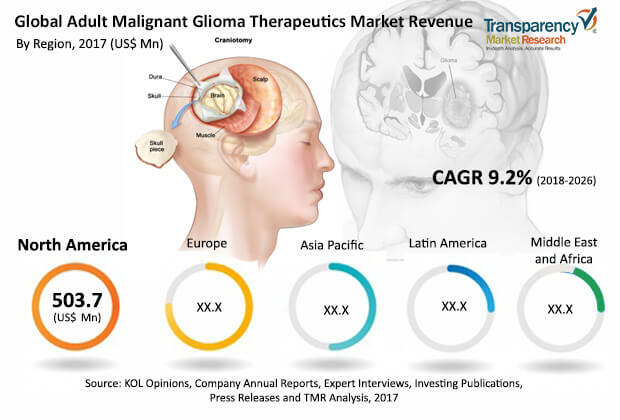 The global adult malignant glioma therapeutics market is highly consolidated, with top three players accounting for more than 65% share in terms of revenue in 2017. These companies are projected to dominate the global market during the forecast period. However, the market is also likely to witness some novel drug launches with innovative mechanism of action by emerging players during the early forecast period. The report profiles leading players operating in the global adult malignant glioma therapeutics market such as F. Hoffmann-La Roche Ltd., Merck & Co., Inc., Arbor Pharmaceuticals, Pfizer, Inc., AbbVie, Inc., Amgen, Inc., Bristol-Myers Squibb Company, Sun Pharmaceuticals Ltd., Teva Pharmaceutical Industries Limited, and Emcure Pharmaceuticals Limited.